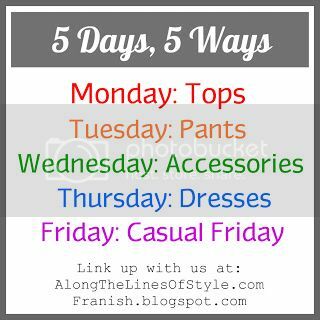 Today's 5 Ways, 5 Days link up is hosted over at Whitney's blog "Along the Lines of Style." Franziska hosted the first two days, and Whitney will finish off the week. This has been a lot of fun for me, if you could not tell. Today's focus is on accessories. Let's just get to it - here are the looks. If you've read My Style post, you'll see that I feel I can improve on my accessorizing, so today was difficult for me to choose a piece, not only that I've documented at least 5 times, but that was interesting enough to blog about specifically. Looking through my photos, I decided to choose this red and purple animal-print-like scarf I got from Express. Red is my favorite color. I've said that before. But not only that, it's just easy to match with - as you saw from my wine skinnies post yesterday. The weight of this scarf is light enough to take me through all seasons (yes, I'm that girl that wears scarves in the summer.) For today's Animal on Animal look, I tied the corners together and wore it infinity scarf style. I love the way it drapes like this! What is your favorite way to tie a scarf? Tomorrow's focus is on dresses! It's not to late to join the party! I think you styled this scarf great in every outfit. Red is a great color on you too! I really like your animal print look. As far as tying a scarf, I like to turn it into an infinity scarf by tying it at the ends. Thank you! 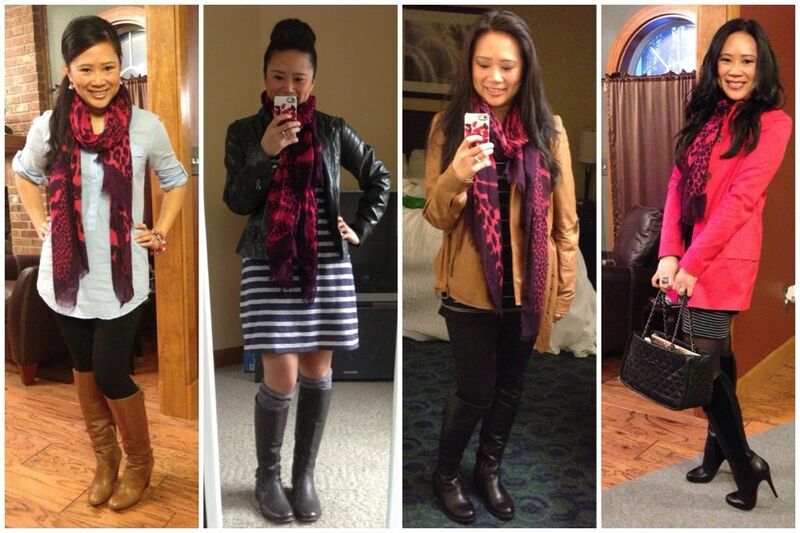 And definitely - I love that any scarf can be an infinity scarf! 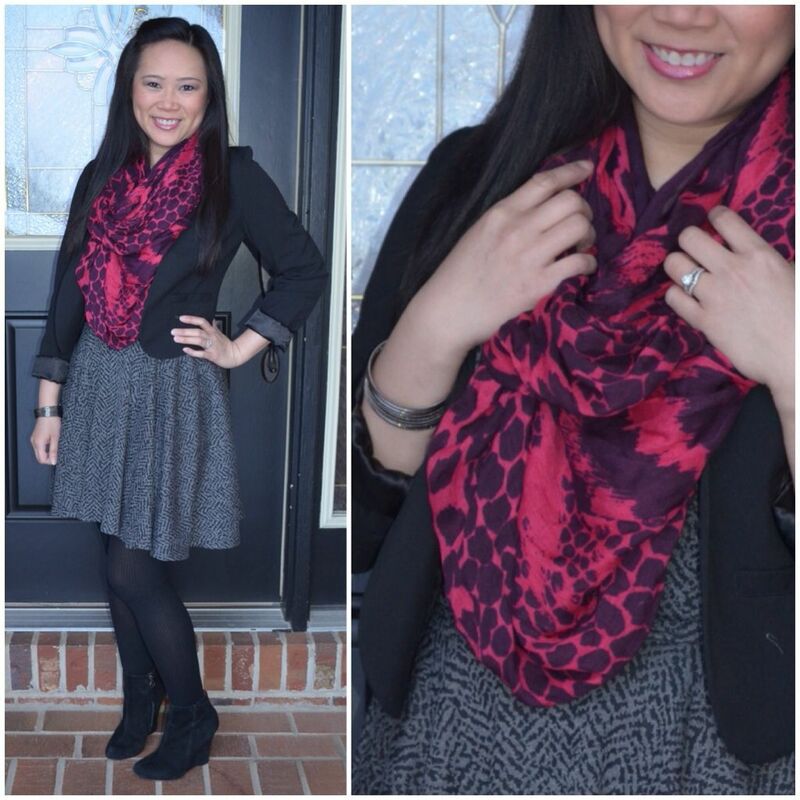 I love this scarf! The colors are great, and it looks like it would be really soft. It honestly looks like it would go with everything! Thanks! And it really does go with everything! I didn't realize how much I wore it until I tried to pin down the piece for this challenge! What a gorgeous scarf! The colors look so fabulous against your complexion. I think it would pop against a gorgeous golden yellow! LOVE the idea of pairing it with yellow! I will have to try that next! Thanks! !